We all have moments of wonder. Moments when we question what is and how it could be. We encounter nature, consider its grandeur and apparent order, and question our place in its schemes. We observe human behavior, with its strangeness and blatant absurdity, and ponder on the reasons we do the things we do as individuals and as a species. We wonder how the societal beliefs, structures, and customs that enable our social interactions — all while infuriating each of us — came to be. We wonder why human interactions are so often pitted as an Us vs Them scenario. We wonder how humans can be both overwhelmingly kindhearted and excruciatingly cruel. At times the world can feel crazy. How do we make sense of it? How do we explain the point at which we’ve arrived as a species? Whether we like it or not, many of the answers we seek will elude us in our lifetime. Our questions can be quite large and this world is extremely complex. Despite our self-proclaimed status as the most intelligent species on the Earth, we still struggle with a surplus of intractable problems. It is challenging to grasp the entire picture — from the Big Bang to the Heat Death of the Universe — but if we break it down into smaller pieces the questions become more addressable. 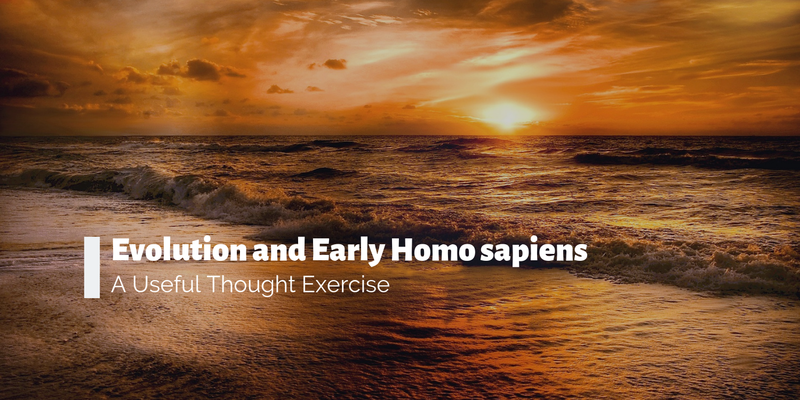 What helps me is an evolution based thought exercise. In early November 2018 I found myself sitting atop the soft sands of Poplar beach in Half Moon Bay, the waves lapping gently in a soothing, consistent pattern. It was a beautiful morning, and I was fortunate to have my wife next to me. We sat with our eyes to the west, looking over the green-blue waters of the Pacific Ocean, and our backs to the ascending sun in the east. The word serene barely does the moment justice. Our conversation ebbed and flowed like the waters before us. We drifted from topic to topic, with no intended direction, simply taking it all in. We discussed our children, our educations and careers, trips we had planned and others we hoped to plan one day. Given enough time in a conversation, I will habitually guide the topic to something bigger. And, as is my custom, I began to ponder deep questions such as the purpose of existence and how we came to be. I also began to voice these questions aloud. My wife is a good sport. If my cross to bear is a chronic existential crisis, her lot in life is to put up with it. A thing she does with astounding grace and a fair amount of patience. I wondered aloud at the early onset and eventual consequences of religion; of whether or not birds won the evolutionary arms race; and the morality of abortion (or of anything for that matter). I pondered what it must have been like to be one of the first people to arrive at the coast and look out over the ocean. How does that person possibly comprehend what their world is? How do they explain the vastness of the water before them? How do they explain the structure of the planet or even their own small ecosystem? As we discussed these topics and various others, my mind landed on an image that I found helpful in bridging many of the questions I was asking and their potential answers. What was this image? It’s actually very simple. I imagined myself in that very spot, sitting next to my same wife, talking about the world we know. But with one simple caveat — the date was 10,000 years ago. Essentially, I put myself in my ancestors shoes (assuming they wore them). This was not the first time I’ve considered this situation. I find it to be a useful thought exercise, as it has the power to make fuzzy things suddenly much more clear. Below is (1) a more in depth explanation of how I employ this thought exercise and (2) a few examples of how it can help us understand the world that we experience. The world that early Homo sapiens knew was so different from the world we know, it might as well have been a different planet entirely. No cities. No countries. No roads. Few sounds or smells that did not occur in the natural world. The number of people you knew was limited to those in your immediate clan — perhaps 15 to 50 people. Though the world was incomprehensibly large your immediate surroundings would have become quite intimate. The border of your existence was geographical — a mountain canyon, or body of water. Knowledge of and interactions with things on the other side of this border were extremely limited. You knew only what you saw or what others told you through stories. It is those stories, the ones early Homo sapiens told, that are the crux of my thought exercise. All species are equipped to survive in their given habitat. From a survival perspective, humans are not gifted with the same traits as most species. We don’t have exceptional strength or speed. We don’t have sharp claws or menacing fangs. We can’t fly, hold our breath for a long time, hibernate, or go months without eating. From a physical perspective we actually appear to be ill-equipped for survival. So, what was it that gave us the ability to rise to the top of the food chain? Some would argue, as I will here, that our survival was assured through our social cooperation. We relied on each other. We worked together. We made plans, solved problems, and divided efforts. Social cooperation is the evolutionary skill that allowed us to survive and thrive. This type of survival strategy requires a heavy investment in something most other species didn’t get — intellect. Our brains are so big that they account for 20% of the calories we burn. From an evolutionary perspective, this complex organ surely must have proven its worth, if it was to be allocated one in every five calories we consume. The empowering of our brains to allow for social cooperation, also resulted in a host of other externalities. We can plan, invent, learn, and teach. Above all else, humans are aware of our existence, and with this awareness are left to contemplate the purpose of it all. As far as we can tell, no other species encounters this unique dilemma, yet our level of cognition nearly demands it of us. It’s in this encounter that we see the importance of stories told by ancient Homo sapiens. Ancient us. They too had the ability to ponder their existence, but they lacked the scientific explanations we are fortunate enough to have today. They witnessed the power of nature; they looked up into the starry night sky, unobscured by modern light pollution; they struggled and fought for survival; and just like us, they needed to make sense of it all. Stories about the creation and deity settled their minds and gave them purpose. Stories about the harshness of nature and the ferociousness of animals provided a buffer from dangers. Stories about their identity protected them from strangers and the world outside. When we imagine ourselves in their position, many of the ongoing social, religious, cultural, and political issues we encounter make a little more sense. Stories helped our ancient ancestors understand their world and survive as a species. Even if we don’t believe the same stories, we carry the survival strategy forward, despite the craziness it creates. Can this thought exercise be classified as scientific? Not exactly. Clearly it doesn’t offer a repeatable test of its validity or even observable evidence that the conclusion arrived at is accurate. Does that mean that it’s not useful? Of course not! This thought exercise is simply a mental activity that provides possible explanation to questions that arise. Is this not how all scientific endeavors begin? It gets us seeing things for how they may have been and formulating possible hypotheses. With luck, we can create experiments to test their validity. On his long walks in the British country side, Darwin hypothesized about the process of natural selection, long before he gathered enough evidence to publish his Earth shattering theory. In a small patent office in Bern Switzerland, Albert Einstein envisioned the interaction of forces that would explain his theory of relativity, long before he could test them. Science is necessary for the revealing of natural truths — the laws that govern existence. However, where science provides answers about specific questions, a good thought exercise provides a connection between those answers and our lives. It’s this connection that I’m after. For more about my approach you can read my disclaimer here. Now, a couple of examples of how this thought exercise works. We all find ourselves in competitive situations. We play board games and sports. We compete with siblings and friends. We strive to be the best in business and in school. We compare the number of likes we receive on social media to the number everyone else receives. We want to win at everything. But why does competition have to extend to every little aspect of our lives? Why are topics such as religion, politics, climate change, and even healthy eating so volatile? Competition is not just a human thing- it’s the way of the world. That’s why it is principle #1 in my short list of evolutionary principles. Competition is crucial, because the survival of individuals and species depends on their ability to out compete others for resources and mates. Now, for the thought exercise — imagine that you are a member of the genus Homo sapiens (same as today) except you are alive 10,000 years ago, give or take a few centuries. You require a handful of basic needs — food, water, shelter, and safety. But again, you are ill equipped physically to secure these necessities on your own. In this situation, you must rely on others to help you. These others are likely your family or clan. Together you can build shelters, hunt and gather food, and protect yourself from outside threats much better than you could ever do so alone. However, not all of the Homo sapiens you may encounter will be part of your clan. You may stray from the group in search of food or water, and along your way encounter someone new. Someone you’ve never seen or met before. Someone who sees you as competition for the food or water that they too are looking for. In this hypothetical situation, which undoubtedly occurred an innumerable amount of times to our ancestors, you have to quickly decide whether the person you have encountered is a friend or an enemy. Is this person one of you or one of them? Well, assuming you even speak the same language, you would need to establish a connection with this person. Are they somehow related to you? Do they know your parents or grandparents? Are they from a clan that is peaceful with your clan? Do they worship the same gods as you? These are all questions designed to establish whether the person you have encountered is Us or Them. The idea of establishing an Us and Them narrative as a survival mechanism has been written about extensively by authors such as Jared Diamond and Yuval Noah Harrari. In the case of our 10,000 years ago thought exercise, the importance of establishing an understanding of the individual you encounter is clear. If you don’t know them, then what reason do you have to believe they won’t kill you? And, if they will kill you, then what reason do you have for not killing them? To our modern selves, it sounds harsh. Very few of us can imagine actually killing another human being. How often this would have occurred we can’t really say, yet this may very well have been the world in which our ancestors lived. In later years, as civilizations grew in population, their borders expanded. New methods for quickly identifying strangers became important, but still they were about establishing an understanding of Us vs Them. Religion provided a quick method of surmising a stranger’s motives. National identity offered a different approach for the same solution. In our day, we continue to use these methods for creating identity among a group that can both support and protect us. While the direct connection to our essential needs — food, water, shelter, and safety— is not as apparent, our evolutionary psychology drives us to take sides. We continue to pit ourselves against those of differing beliefs and ideals, because our ancestors found this practice to be beneficial to their survival. As an extension of this idea consider the level of identity people come to possess in relation to their home town, high school, college/university, employer, and even favorite professional sports teams. Crazy right?! Thanks to the social evolution of our past, we are unfortunately hardwired to see others as either Us or Them. We have all experienced the feelings of pride associated with accomplishing something others find impressive. Likewise, we all know the feeling of embarrassment or shame when we have done something others find repugnant. There are certain types of emotions — known as social emotions — that are believed to be unique to highly social species, such as Homo sapiens. Examples of these emotions include pride, embarrassment, remorse, jealousy, envy, and empathy. These emotions arise in humans because we have an advanced cognitive ability to recognize that others may have different thoughts or emotions than our own. This ability is known as theory of mind. The fact that we have these abilities i s fascinating enough, but we don’t just have them — we can even understand them and debate their merits. Yet, all of this advanced ability does not always make handling these emotions an easy task. So why are they a part of the human experience? Why do we need them? And how did we end up with them? The answer to these questions likely goes back much further than 10,000 years, but we can still use our same thought exercise to reveal the evolutionary benefit of social emotions. Imagine you are a member of a small clan of humans, who rely on each other for survival — food, water, shelter, and safety. Belonging to your clan, especially when the stakes are high, is crucial for your survival. And in our ancestral state, the stakes were often high. Acting in the best interests of the clan ensures your continued acceptance in the clan, which in turn, ensures your continued ability to rely on the clan for survival. If you were to perform a selfish act, one that would put the clan at risk, they may turn on you in an aggressive and violent manner. But, if you do something slightly less damaging but still not agreeable to the others, the reaction can be much less severe. You would in turn experience a level of emotional stress related to their reaction — embarrassment, guilt, or shame. In this way, you can see that negative social emotions can inform individuals, beginning at a young age, how to ensure their belonging within a group. Small mistakes, with social consequences, teach individuals to avoid making much costlier mistakes later on. The social emotion jealousy (or envy) is also an interesting topic to explore. Clearly there is a survival value intrinsic in desiring more, even if it is driven by seeing what you lack in comparison to others. Again, competition is a powerful force, even among individuals of the same species. The drive to have more is not just about pride or appearances. Access to better hunting grounds or gathering fields provides a real advantage in the struggle for survival. Improved shelters, tools, and clothing provides a better chance that you will outlast your competition. Increased influence over your clan and others will grant you more control over your standing in society. Paired with negative social emotions, such as shame, envy can be a powerful survival tool. It’s no wonder that we often struggle, with it to such a degree. Our ancestors survived and reproduced, allowing us to come into being, in large part thanks to the development of social emotions. In the preceding paragraphs, I’ve provided a couple of examples of how to use this thought exercise. Below are more ideas that come to mind for me now. You can explore the topics I’ve provided or use this thought exercise to explore the questions you already have bouncing around in you head. Since that beautiful morning, resting on the sands of Half Moon Bay, I’ve found this thought exercise helpful in finding answer for my own questions and the questions that inevitably arise during conversations with others. In my opinion, seeing things through the lens of our ancestors is not just enlightening, it’s also a lot of fun. Questions still remain. Are we simply the product of our evolution or can we rise above it? I think we can. We’re not just the result of our evolutionary biology, but our psychology as well. We have the ability to perceive and reason, so even if the 10,000 years-ago thought exercise explains behavior, it doesn’t mean that we have to be locked into that behavior. Remember — kindness, humanity, and love are the answer.